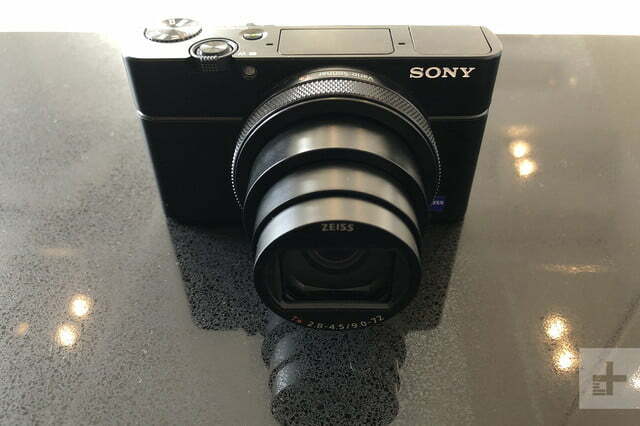 Sony’s RX100 series has long been praised for fitting a large 1-inch-type sensor in a pocketable camera and the Sony RX100 VI makes the biggest physical change the series has seen in years. Announced on June 5, the new advanced compact camera squeezes a 24-200mm (full-frame equivalent) lens into the same form factor as its predecessors. The lens covers a range popular with professional shooters on full-frame interchangeable lens cameras, but one that’s usually split into two lenses: a 24-70mm and a 70-200mm. Altogether, that’s an 8x zoom range, a considerable increase over the 2.9x zoom of the RX100 V, IV, and III, which all used the same lens. In order to fit it into such a small space, however, it lacks the fast f/1.8-2.8 maximum aperture of those cameras, instead making due with f/2.8 at the widest and f/4 at the telephoto end. Giving up a stop of light for extra reach may be a worthy trade-off for many users, however. 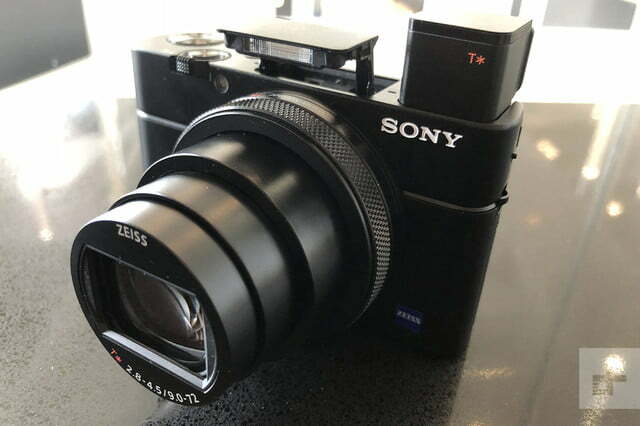 Behind the lens is a 20.1-megapixel, 1-inch-type stacked sensor, continuing the stacked design Sony first introduced with the RX 100 IV. 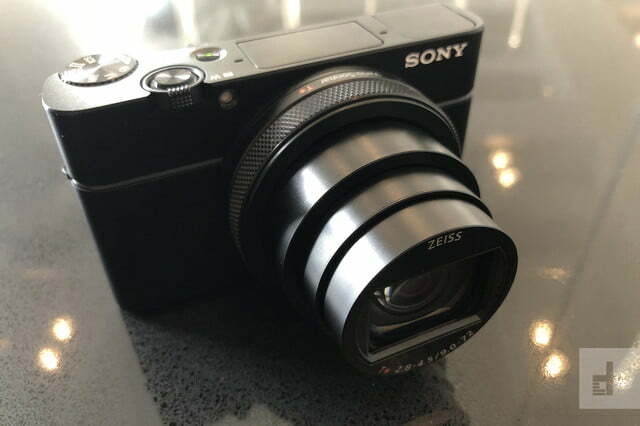 While the specs here are similar, Sony redesigned both the sensor and processor for the RX100 VI. 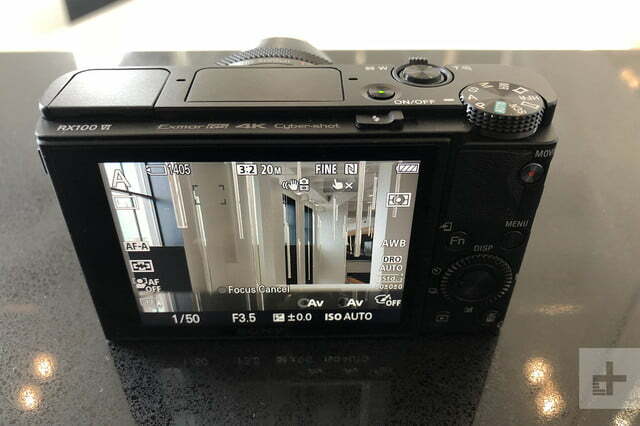 The stacked design allows the camera to process images at a faster speed, giving the Sony RX100 VI a 24 fps continuous shooting at full resolution, just like its super-zoom cousin, the RX10 IV. What is perhaps even more impressive is that the camera can keep up that speed for 233 JPEG images — and the continuous autofocus can still keep up with that top burst speed. A Bionz X processor, an update from the previous generation, also helps achieve that high speed. 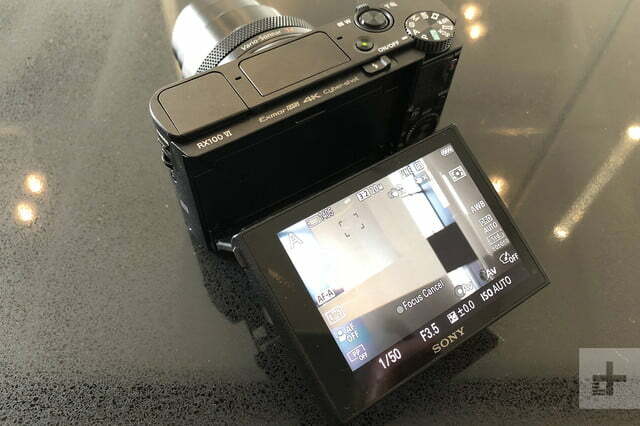 The Sony RX100 VI’s stacked sensor and upgraded processor also allows the compact camera to shoot in 4K at 24 fps, with continuous autofocus available while recording. Sony says 4K is recorded with full pixel readout without pixel binning to help keep the sharpest possible detail. 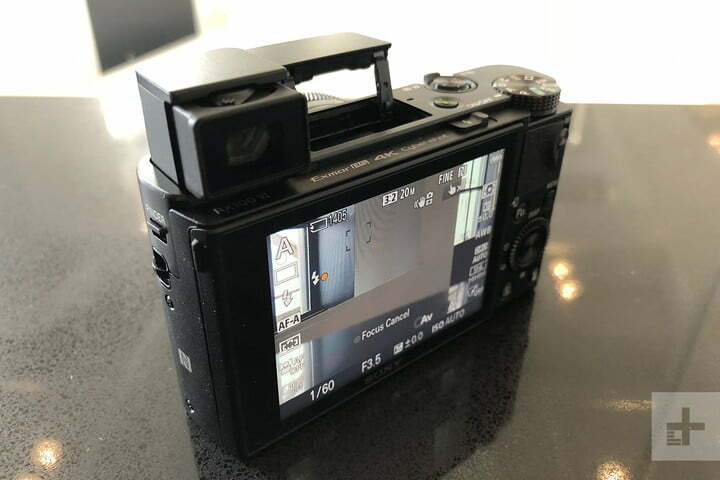 Video features give professional cameras a run for their money — the RX100 VI is the first camera in the series with 4K HDR using Hybrid Log-Gamma (HLG) picture profiles. Additional video features include S-Log3/S-Gamut3; 120p HD video; slow-motion video at 240, 480 and 960 fps; and proxy recording. Sony continues to emphasize autofocus performance in its compact cameras, with the RX100 VI boasting a class-leading lock-on time of just 0.03 seconds in ideal conditions. The autofocus system uses 315 points covering 65 percent of the sensor for the phase detection portion of the camera’s hybrid AF system. High-density autofocus, a mode for following moving subjects, is also included. The camera’s eye detection mode for photographing people is also two times more accurate compared to the predecessor, Sony says. An optical image stabilization system helps keeps the camera steadier in low light and at the long end of that zoom, with a stabilization rated to raise the shutter speed by up to four stops. An anti-distortion shutter helps minimize the effect of rolling shutter when using the electronic shutter. While packing in a much larger lens, the Sony RX100 VI doesn’t stray from the series compact body style, weighing 10.7 ounces, which is only 0.2 ounces heavier than the fifth generation camera. With the lens retracted, the camera body measures about 1.7 inches deep. The lens achieves its compact dimensions thanks to its complex design, using eight aspherical elements along with two extra-low dispersion elements. The camera body still houses a retractable electronic viewfinder with a resolution of 2.35 million dots. The tilting touchscreen also includes a touch shutter, another first for the series. Bluetooth, NFC, and Wi-Fi are all built in. Also announced was the Sony VCT-SGR1, a compact shooting grip that doubles as a mini tripod. 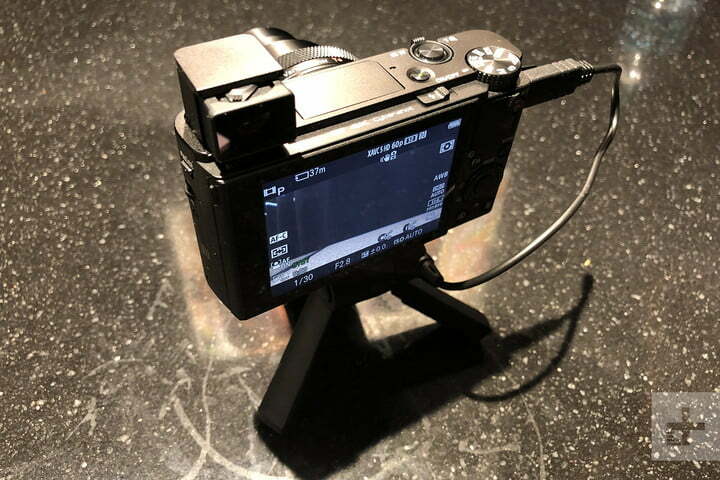 The grip attaches through the micro USB port and includes buttons to control the shutter and zoom. The grip is adjustable between 70 degrees up and 100 degrees down, while legs at the bottom will hold the grip upright on a flat surface. The VCT-SGR1 won’t begin shipping until September at a price of $100. 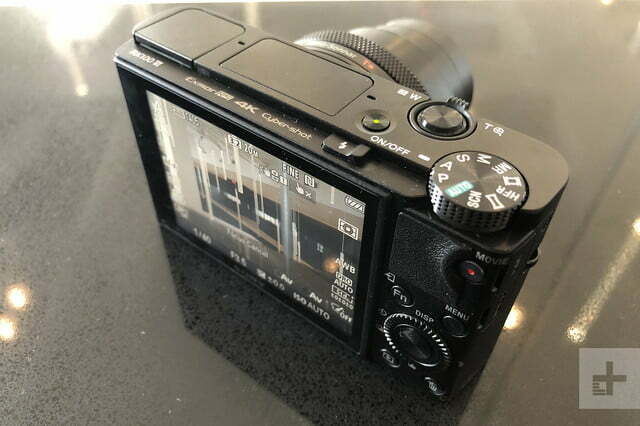 Sony’s RX100 line has always matched premium features with high prices, and at $1,200, the RX100 VI certainly continues the trend. 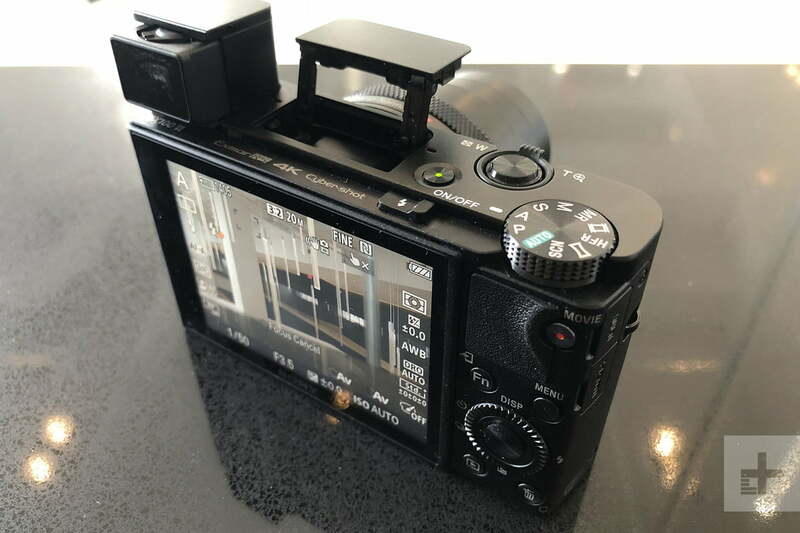 If the RX100 VI delivers images that are anything like the predecessor, it could be the best compact camera on the market, however. It is expected to be available in July.